Caught in a political crossfire, another measure that would permit the $75 million factory trawler to work in U.S. waters has failed to pass the U.S. Senate. Federal legislation to authorize a $75 million Anacortes-built factory trawler to work in U. S waters has foundered — for the second time this spring — in the turbulent political seas of Congress. The still-unfinished America’s Finest — built by Dakota Creek Industries — is banned from U.S. waters because its hull contains too much steel that was modified overseas, putting it in violation of the Jones Act. 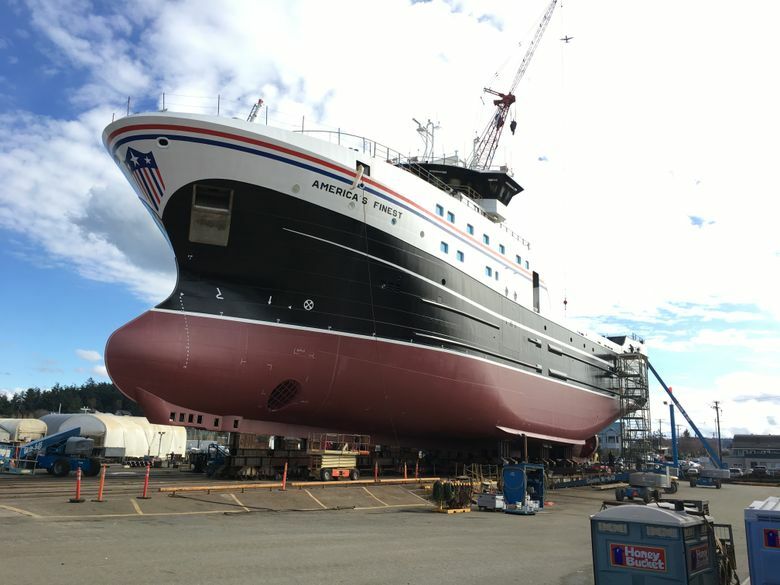 The Anacortes shipyard and the vessel’s owner, Fishermen’s Finest, have sought for months to gain a congressional waiver to the act. A provision to allow the 264-foot vessel to net and process fish off Alaska failed to make it into the spending bill passed by Congress in March. The Coast Guard reauthorization bill that failed to gain passage this week in the Senate includes the waiver for America’s Finest. But it also includes a controversial measure relating to regulation of ballast water that stirred strong opposition from Democrats. Sen. Maria Cantwell, D-Wash., has been in the thick of the negotiations over the Coast Guard bill. Cantwell worked to include the waiver in the Coast Guard bill in a deal struck with Sen. Dan Sullivan, R-Alaska, that includes fishing restrictions sought by competitors of Kirkland-based Fishermen’s Finest but fiercely opposed by the company. But Cantwell said she decided she could not support the bill due to the ballast-water measure, which Republicans said would set a much-needed national regulatory standard but faced strong opposition from environmentalists who said it would reduce protections against invasive species that can be introduced during discharges. Sen. John Thune, the South Dakota Republican who chairs the Senate Commerce Committee, had a sharply different take, accusing Cantwell of a flip-flop on the measure. It is uncertain when — or if — the Senate again will take up the waiver for America’s Finest.